Amadeus is one of those films honored by the Academy that, because of the perfect storm of subject, lack of recognizable stars, and what-have-you, is for the most part, generally unknown by the modern public – at least that’s the way it seems to me. 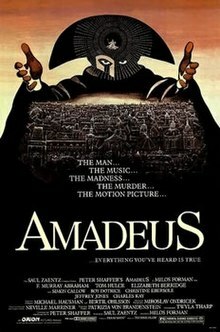 After all, whenever I discuss any movies, especially Best Picture winners, nobody mentions Amadeus. The action-nerds talk about Platoon, the sci-fi guys talk about 2001 and Star Wars getting shafted, the costume drama buffs talk about Gone With the Wind, and the musical buffs have a million to choose from. Even thriller guy gets to talk about Silence of the Lambs. But nobody talks about Amadeus and it’s probably because 1) there is no classical music guy just dying for this film, 2) that because of its decided lack of star power, the general public has no clue Amadeus exists at all, and 3) if somehow, someone knows it exists it’s only because they’ve been in the video store, saw the Best Picture Winner sticker on it, had a look and immediately put it back. And really, why shouldn’t it be ignored by the general public? The general public likes big robots from other planets turning into cars. The general public likes seeing dead people. The general public likes things that blow up. Does any of this happen in Amadeus? Of course not. It has nothing the public wants and so, notwithstanding it’s Oscars, is fairly consistently ignored. But that doesn’t mean it’s awful. I mean, just consider was it does have? It has a cunning story, about two composers, one of whom is effortlessly talented, the other effortlessly jealous. The talented of the two is a boor, the jealous is pious and in a fit of rage at god for giving a buffoon such easy brilliance, the jealous of the two decides to destroy god’s chosen one. Being that the jealous man is a court composer in Vienna, he has the wherewithal, and means, to make it happen. But just because it has something, doesn’t mean the general public wants it. The Academy might – and did – but not the public. Fortunately, I am not a member of the general public – I am a genius par excellence* and have thoroughly enjoyed Amadeus ever since I first saw it at 16 or 17. It’s got much to love about it. The performances are good. There is real drama and real tension. There is even some comedy. Still, it’s also got much to quibble with. Perhaps it’s too long – no, it’s definitely too long. But that’s maybe only because it’s redundant in spots: we know Mozart is a boor, we know he spends money and we know Salieri hates him – we just don’t need to be hit over the head with it twelve times to figure it out. Certainly, nobody ever went broke underestimating the general public, but, sometimes enough is enough. And the performances? Well, I know Hulce and Abraham were both nominated for Best Actor, and Abraham won, but neither truly gives a great performance in the film, and if either of them did, it was Hulce, sweeping between his manic boorishness and his Amadeus’s almost child-like need to be loved by his father. Incidentally, watching it, I was somewhat struck by the parallels of this film and The Social Network, specifically the Winklevi and their attempts to destroy Mark Zuckerberg. Sure, this isn’t a perfect parallel, but it made me think. Amadeus was distributed and bankrolled by Orion Pictures. Orion started production in 1978 and over the next 12 years, won four Best Picture Oscars, the most of any studio during that time: Amadeus, Platoon, Silence of the Lambs and Dances With Wolves. It’s thanks for greatness? Going into bankruptcy in 1991 and eventually was sold off and disappeared, releasing it’s last film in 1999. There are only two men who have won three Oscar’s for producing Best Picture winners: Saul Zaentz and Sam Spiegel. Spiegel got there for Lawrence of Arabia, Bridge on the River Kwai and and On the Waterfront. Zaentz got there with One Flew Over The Cuckoos Nest, Amadeus, and The English Patient. Incidentally, both men were recipients of the Irving Thalberg Award. The only man who might better then would be Irving Thalberg himself. Though he never took an Oscar, because until the 50’s the Best Picture Oscar went to the studio, not the producer, he shepherded Broadway Melody, Grand Hotel and Mutiny on the Bounty to victory. Even better, he couldn’t win the Thalberg Award for him, because it was named after him. For the other winners and films left to see in this little project, click here.